Buy more items at U.S. bebe stores or bebe online and save more money! Spend $150 or more and get 15% off your purchase. Or, spend $250 or more and get 20% off your purchase. 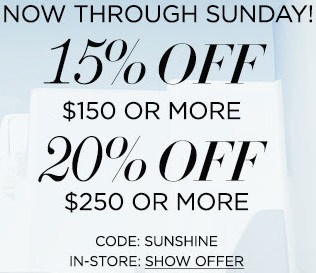 To get the offer online use promo code SUNSHINE at checkout. In-store show bebe emaili with this offer. Plus, get an additional 50% off already reduced prices. Some exclusions may apply. Source of the information is bebe. Offer expires on Sunday, June 12, 2016. For more details visit any bebe store or bebe online.